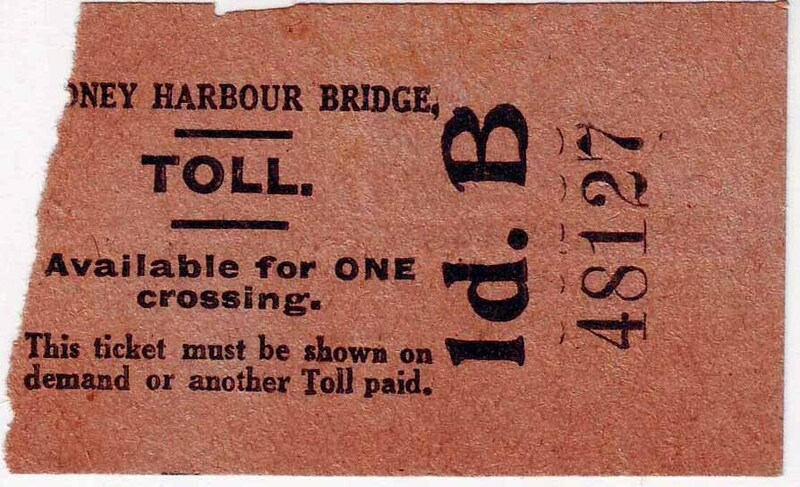 For many years now I have collected toll tickets from Australia believing them to be revenue stamped paper. This is still a grey area in the F.I.P. exhibiting arena but if the subject is treated correctly and within the revenue criteria it will be acceptable. Below are tickets from my collection. 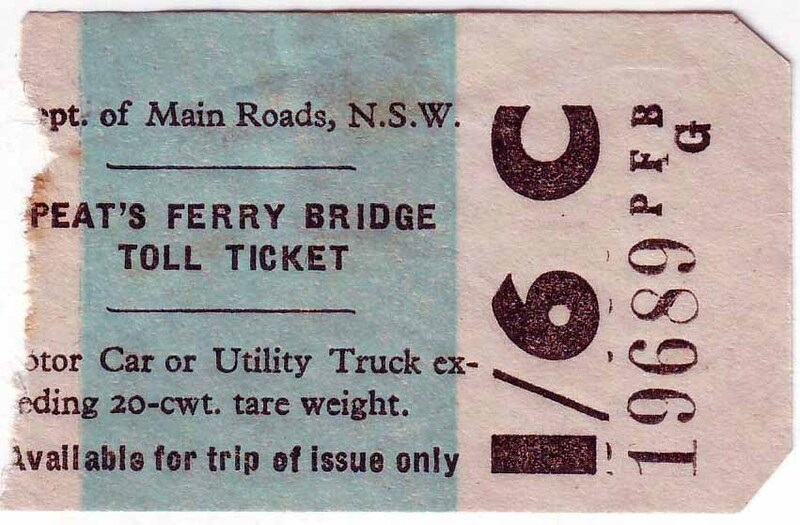 * From 26/4/1929 the ferry was replaced by a bridge the tolls being lorries to 1½ tons 6d, to 3 tons 1/-, over 3 tons 1/6; trucks 6d; motor buses 1/6d; motor cycles with rider 6d, without rider 3d; motor lorries 1/6d; bicycles 1d; horse drawn vehicles- 1 horse 3d, each extra horse 3d; loose stock- horses & cattle 3d, sheep 1d; horse & rider 3d. Quarterly tickets were also available. In 1931 charges were increased (eg, cars 6d to 1/- as were as quarterly tickets) but charges were again reduced in 1937 to motor car 6d, motor bus 1/6, motor lorry 6d-1/6, trailer 6d, motor lorry (carrying passengers or fitted with seats, permanent, temporary other than drivers) 1/6; motor cycle 3d & side car or tricycle 6d, bicycle 1d; single horse vehicle 3d, two horses 6d, each extra horse 3d; loose horses/cattle 3d, sheep 1d; horse & rider 3d; passenger on foot or vehicle free. From 1937 Sunday cars were charged 1/-. 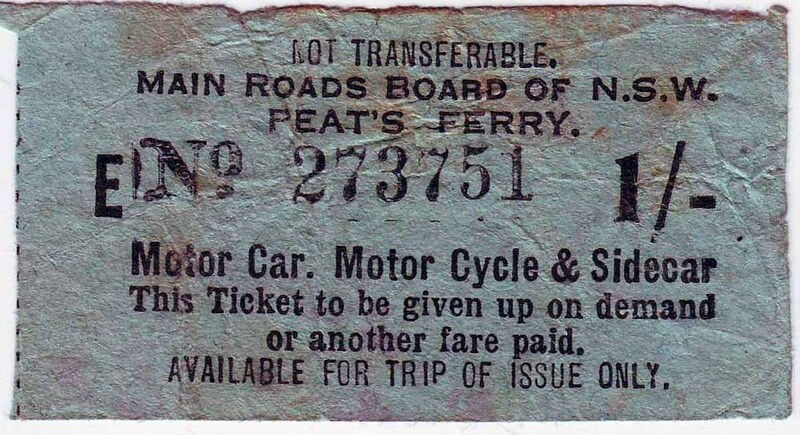 Quarterly tickets in 1937 were motor car £2to £2/10/-, motor bus £6to £6/10/-, motor lorry £2-6 to extra 10/-; motor cycle £1, with side car/tricycle £2; vehicle (1/2 horses) £1. In 1943 special provision was made for cars equipped with gas producer engines. In 1952 cars were 6d but 1/- on weekends and public holidays. 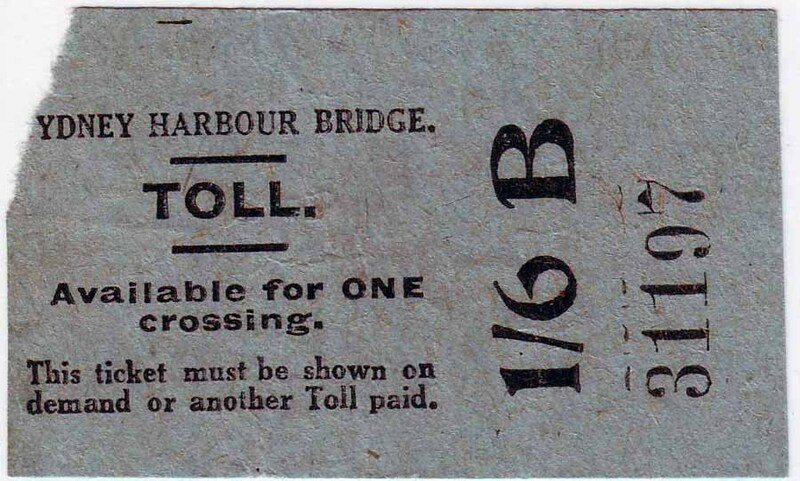 The last toll was levied on 31/5/1952. 3 types of tickets known. MAIN ROADS BOARD OF N.S.W. 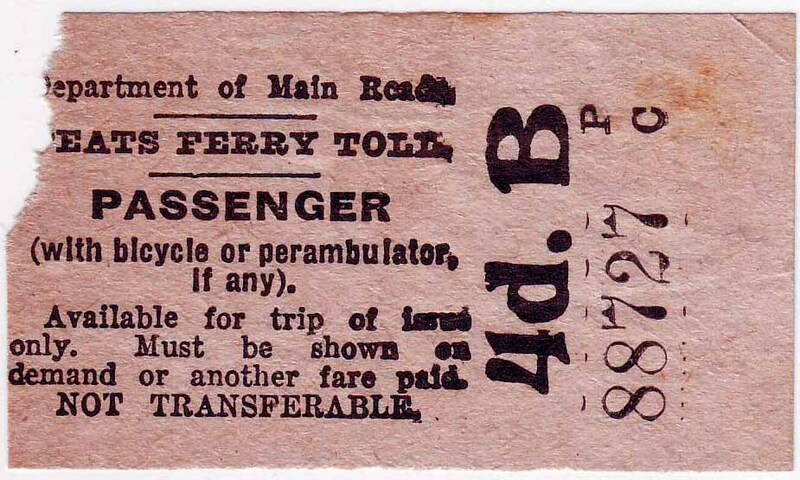 * Local Government 1919 Ordinance 33 dated 23 May 1930 established the tolls at child (under 4) free, (aged 4-14) or in vehicle 2d; passenger on foot or vehicle including in buses 4d; passenger with perambulator or wheel chair 4d; passenger with bicycle 6d; motorcycles 9d solo), horse & rider 8d; car, bicycle and side-car with driver 1/-; horse-drawn vehicles (2 wheeled with 1 horse 8d, 4 wheeled with 1 horse 1/-; each additional horse 6d); motor lorries, vans and trucks to 3t 2/6d, buses (20 or more passengers 40/-); horses or cattle 6d each; sheep or pigs 3d each. Loaded vehicles exceeding 1t were not permitted. 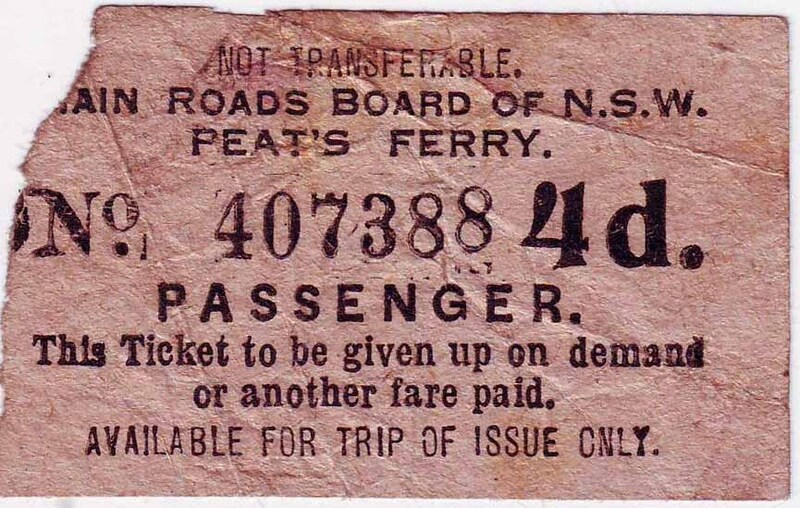 * The Peat’s Ferry tolls were modelled on those in operation for the crossing of Sydney harbour between Sydney and Milson’s Point with suitable allowance for the lesser traffic density, but were, in the absence of the regulating authority which has since been established, designed, so far as passenger and goods service of a public character were concerned, to prevent unreasonable competition with the railway. They practically eliminated motor omnibuses. From 16.6.35 charges were child 4-14 1d; motor bike, horse & rider 6d; motor lorry 1/6-4/-. Ordinary rates applied to 12.15am when they were doubled. There were also special trip rates 1.30am-5am of £1, vehicles 10/-, passengers 2/6. Dept. of Main Roads N.S.W. 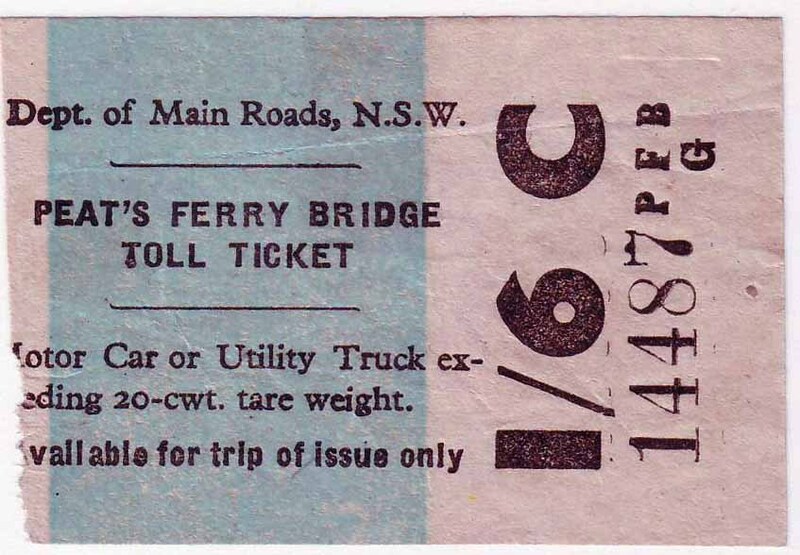 * The Peat’s Ferry Bridge at Hawkesbury River, replacing Peat’s Ferry, was opened on 7 May 1945 and tolls imposed till 1954 when it was paid off. It is now partnered by a new bridge carrying the F3 freeway which was itself a tollway for some years after being opened in 1965. Motor cycle solo 6d, with side car or motor tricycle 1/-; horse drawn vehicle (2 wheeled 6d, 4 wheeled 1/-); trailer 6d (to 3t 1/-); car (not over 20cwt 1/-; over 20cwt 1/6d); bus or coach (up to 20 passengers 3/-, over 20 4/-); lorry or vehicle over 3t 6/-; lorry not otherwise specified in the ordinance not over 2t 2/-, 2-3t 3/-, over 3t 4/-; bicycles and wheel chairs free. Also known with thin colour bar. 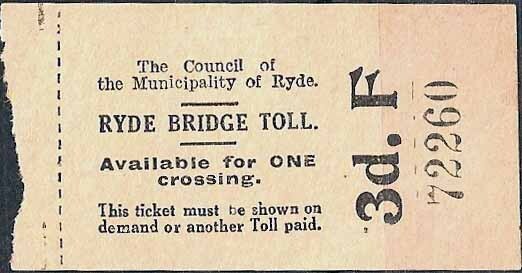 * Administration and collection of bridge toll was the responsibility of the Main Roads Board, later Department of Main Roads. 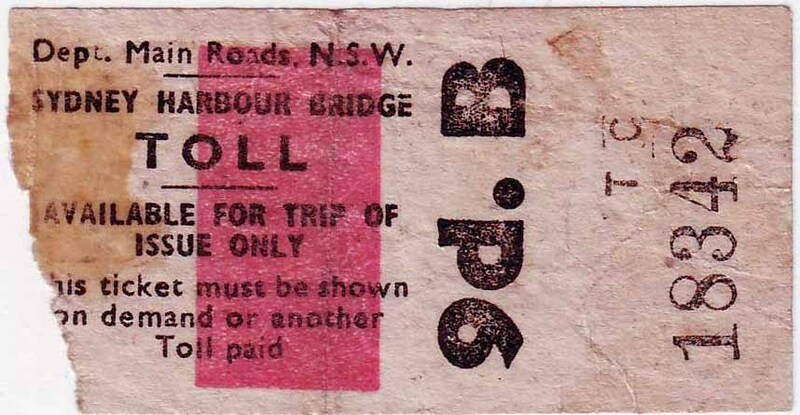 Sydney Harbour Bridge toll charges 1932 6d motor cars and motor cycles with side cars attached plus 3d for any other adults; 3d bicycles, tricycles, motor cycles without side car; 3d sulkies and 4 wheel buggies and light carts; 3d horse and rider; 1/- vans, lorries, drays, wagons (tare not exceeding 2 tons); 2/- (between 2-3 tons); 3/- (over 3 tons); 2d (per head) horses or cattle (loose stock); 1d (per head) sheep or pigs (loose stock). 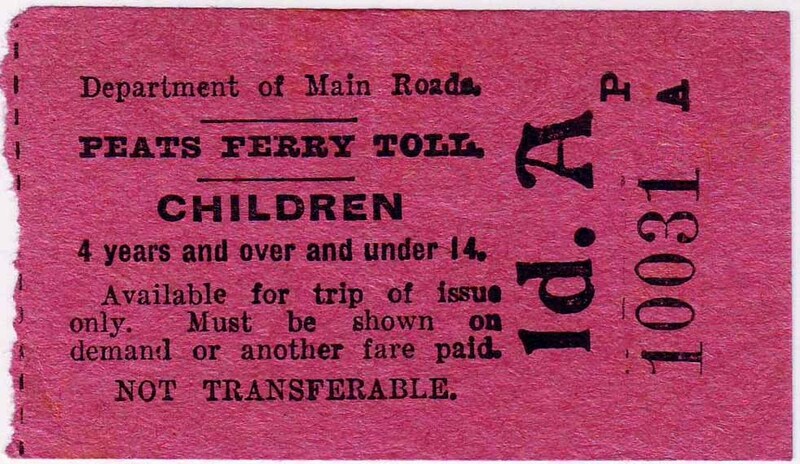 Tram fares reduced from 4d to 3d October 1932 to 2d January 1938 (child 1d). 1941 increase? 4/4/1960 Flat rate single coin toll for each class of vehicle in either direction. (1/- for cars). 2/1/1962. Ticket system replaced by registration. 4/7/1970 toll 20c, 40c for lorries over 2t. ; one way collection; some automatic booths. 1987 toll $1. Tokens were also once used. From 4.4.1960 a flat rate single coin toll for each class of vehicle in either direction applied and the toll was abolished for private cars. Only 3d 6d 1/- and 2/- tickets remained on issue. 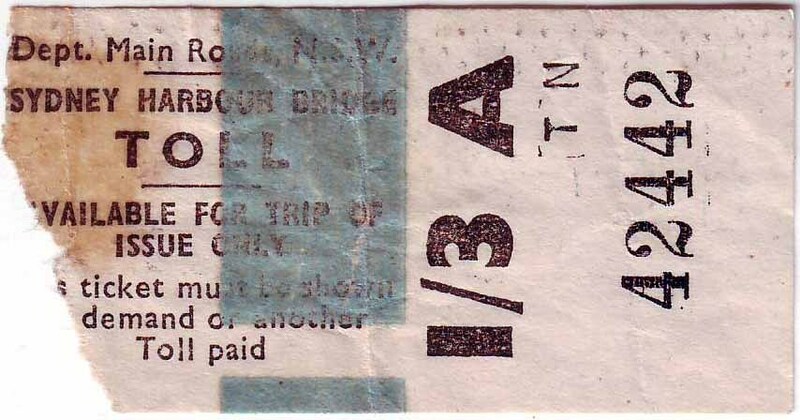 * On 2.1.1962 the ticket system was replaced by a cash register system. On 4.7.1970 the toll was 20c, 40c for lorries over 2t. with one way collection and some automatic booths. 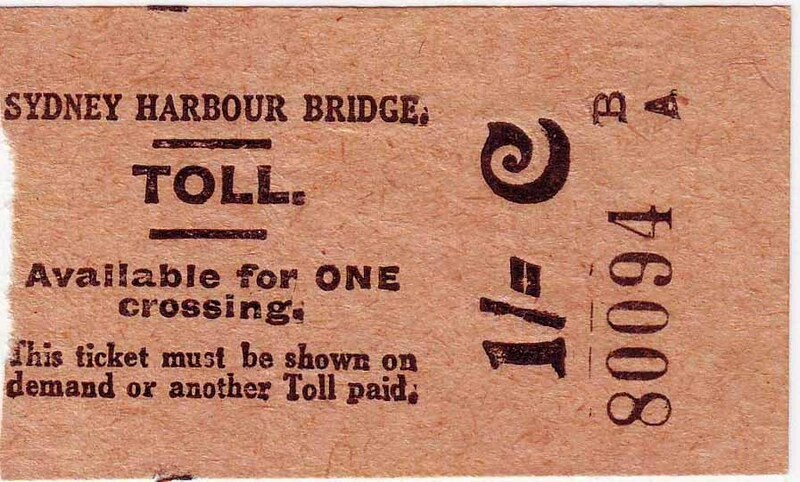 In 1987 the toll was $1. 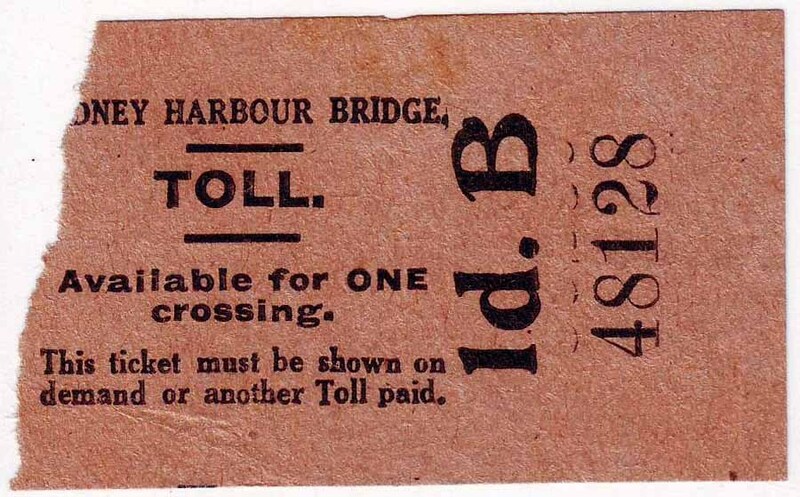 Toll tokens were introduced in 1989 on a 4 month trial along with books of 25 tickets for $37.50, periodic passes (window stickers) & toll account voucher system. The tokens were also available from some local garages. They were withdrawn in 1991. 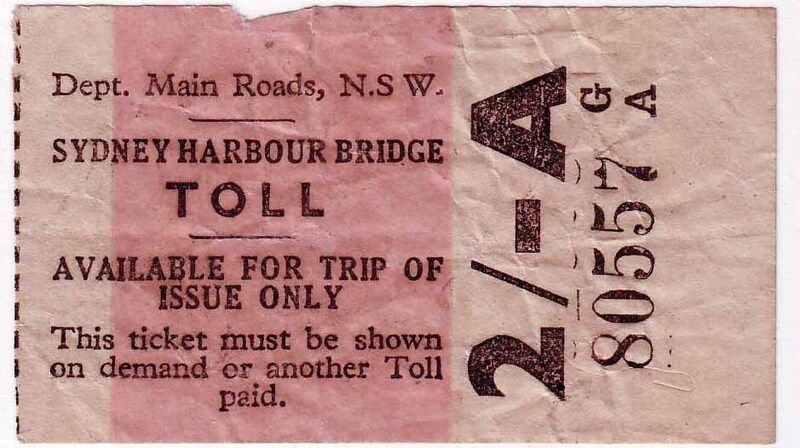 When the Sydney Harbour Tunnel opened in 1992 the toll rose to $2 and the same charges applied. Motorists are now encouraged to use E-Toll electronic arrangements though in 2003 these are not still uniform over all freeways. * A wooden bridge across Middle Harbour at the Spit was opened on 23 December 1924 by the Sydney Harbour Trust for the Manly Municipal Council. 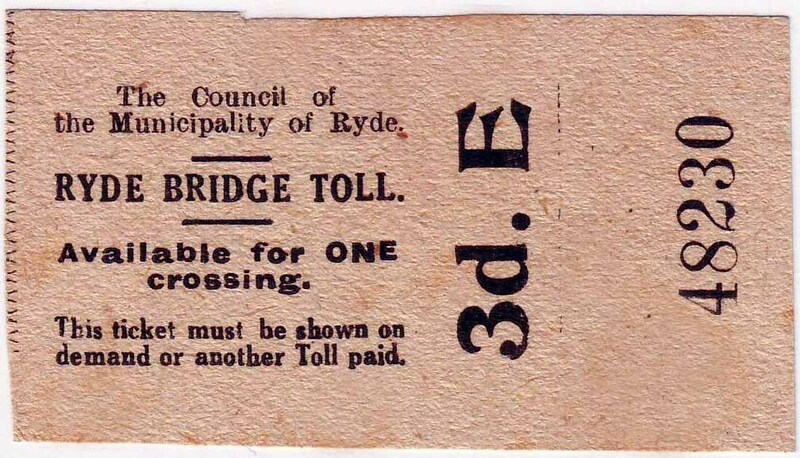 Tolls were levied to defray expenses until 1930 when the bridge had been paid for and was transferred to the state government. 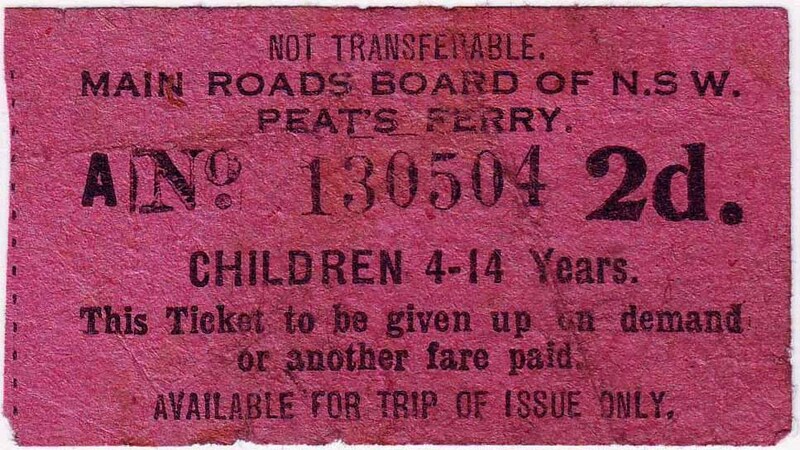 One type of ticket known, also sold in books. * When the bridge opened in 1935 the tolls were: 1d sheep & pigs per head; 2d horses & cattle-livestock; 3d motorcycles without sidecars, bicycles, tricycles, sulkies, 4 wheeled buggies, handcarts, horse & rider; 6d motor cars, motorcycles with sidecars, trade vehicles of 2 wheels, horse-drawn; 1/- vans (empty or loaded), lorries, drays, wagons, tare weight not exceeding 2 tons; 2/- vans (empty or loaded), exceeding 2 but not 3 tons; 3/- vehicles not otherwise. In 1939 charges were reduced: cars 6d>3d, motor cycles 3d>2d, light utility trucked 1/->3d, lorries 1/- to 2/->6d-1/-, bike, trike 1d, horse, cattle, sheep or pig not in vehicle free. 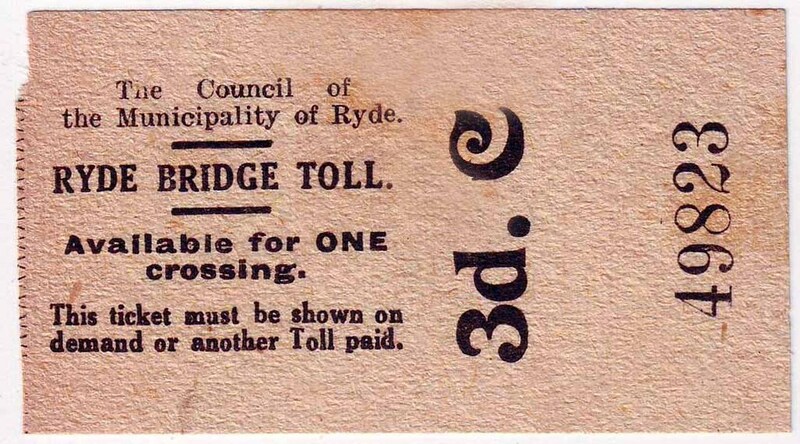 The Ryde Bridge toll tickets were also printed by the NSW Government Printer and were 1d orange, 2d grey, 3d yellow, 6d white, 9d lilac and 1/- blue. In 1938 tickets were 1d 2d 3d 6d 1/- 1/6 2/-. The letters A-E denoted staff and only the 6d ticket has a suffix “G” after the number, probably because it was the most used and the “G” series had been reached by 1938. Details of later changes of charge or denomination are not presently known. There is a later type on white paper with thick colour bar. Please contact Dave if you can add ticket graphics or information to the above listing. * My thanks to Richard Peck, Sydney, for the early release of information which is to be used in a book of the tolls of Australia Richard is presently working on.